UILT TO LAST: Constructed from durable, sturdy metal and featuring soft mesh side panels, the play pen is safe and secure to use and will stand the test of time. Panels have secure corner attachments to connect one another, compact design allows for quick & easy storage. Portable, which makes it ideal for travelling & using in multiple areas around the home. WALK THROUGH DOOR: Built with a door which is ideal when using as a barrier gate. No need to bend over the play pen to reach your children, it also has a stay open feature when you need quick access. OPTIONAL ONE WAY SWING: The door can be set to open in one direction only making it perfect for top of stair use. GREAT FOR PETS TOO! : Use as a barrier to keep your pets away from dangers or areas they are not allowed to be in. Alternatively set it up as a play pen to keep pets confined to a certain space. 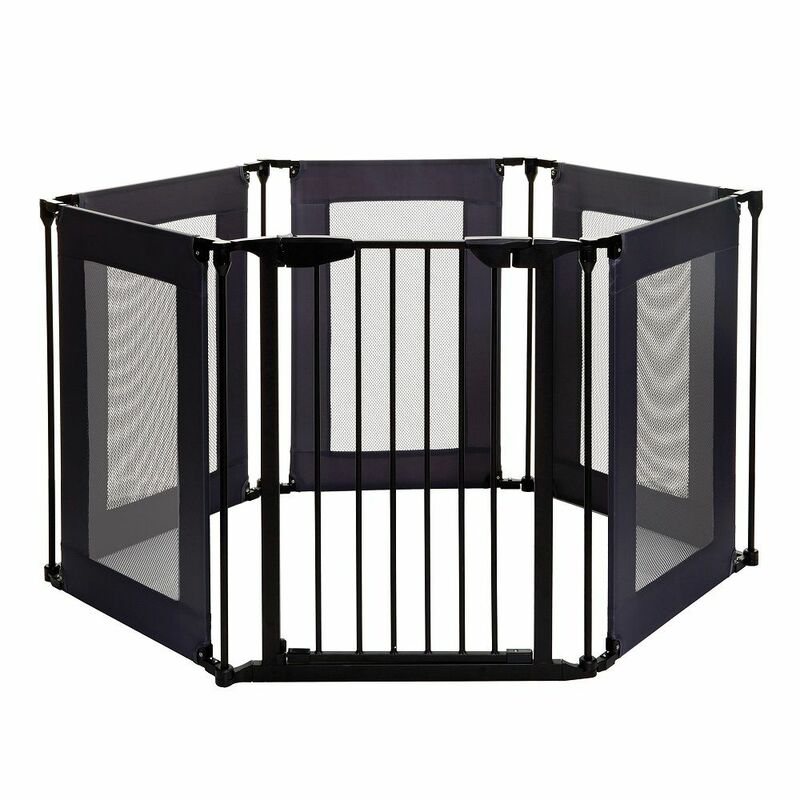 Brooklyn Converta Play-Pen Gate with Mesh Panels The Dreambaby Brooklyn Converta Play-Pen Gate is a versatile and convenient way to keep your child safe and provide a large, sturdy play area for them anywhere around the home. Easy to install and made from durable metal, this is a fantastic addition to any home. As a 6-panel playard and featuring soft mesh sides for easy visibility, it can be set up in a variety of shapes, remaining large enough for your little ones to enjoy free space to play around in. The clever 3-in-1 design allows the panels to be configured to: 1) create an extra-long gate, 147.5 inch wide; (panel extensions sold separately) 2) create a protective guard around a room or door; 3) create a fireplace guard. The EZY-Check indicator shows the gate is securely locked with just a quick glance and the double action locking feature helps keep even the most curious toddlers at bay. Smart Stay-Open feature is perfect for when you need to move freely through the gate, just swing the door in the stay-open position.